They say the neon lights are bright...how about the audience? 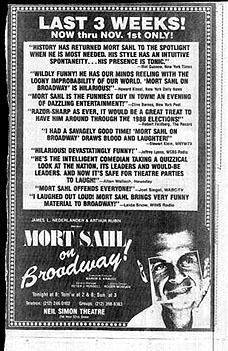 (A Musical Revue, Mort headlined, with folk singers David Allen, Erik Darling, Robin Howard, Dylan Todd, Mary Travers and Donald Vogel, and music from the Jimmy Giuffre 3 (Jimmy Giuffre, Bob Brookmeyer and Jim Hall. The folk songs performed included "Deep Blue Sea" "He's Gone Away" and "Cry Holy. ").